Crude prices this morning are $46.66, rising slightly higher since yesterday. 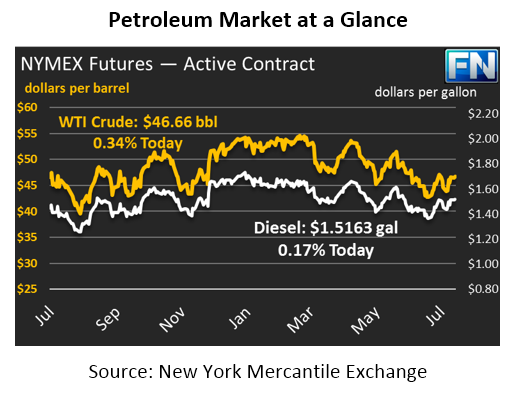 Prices fell throughout the day yesterday, closing at $46.02, but prices have risen 1.3% to its current level. Prices opened the day at $45.99, and have gained $.67 throughout the morning. 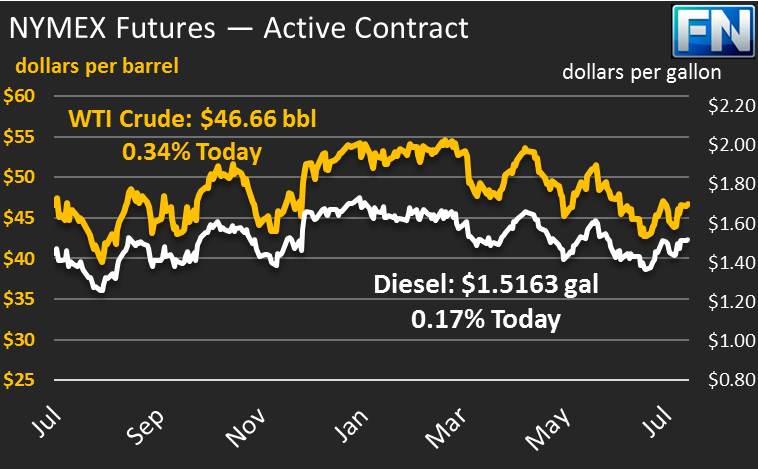 Diesel prices are $1.5163, a gain of $.0168 since yesterday. Prices opened exactly two cents below yesterday’s opening price, yet today’s high has already surpassed yesterday’s morning peak price. Prices are generally higher this morning in response to a falling U.S. Dollar. Yesterday, the Senate signaled that they would not be able to pass a new healthcare bill, which did not sit well with markets. The U.S. Dollar reached 11-month lows as traders realized that the pro-business policies promised by Trumponomics may not reveal themselves quickly, or at all. Countering the dollar’s price support, the EIA released an updated forecast for U.S. crude production in August showing 113-kbpd growth, marking the eight month of consecutive U.S. output growth. Along with the news, Ecuador dealt a devastating blow to the OPEC production deal by saying that they would pull out of the deal to increase revenue. OPEC countries have a long history of cheating on production agreements, but rarely do countries openly announce their intent to violate an agreement. While Ecuador’s 26 kbpd cuts were miniscule compared to the overall 1.3 million barrel cuts, other countries could echo Ecuador’s concerns and choose to exit the deal as well. If that happens, the market would once again be awash in supply, bringing prices significantly lower for consumers. While a short-term boon to consumers, a renewed supply glut would put many U.S. crude producers out of business, reducing U.S. crude (and overall economic) output. The market looks forward to this afternoon’s API predictions for product inventories. Market expectations are for a 3.74 MMbbl crude stock draw, accompanied by a 1.0 MMbbl stock draw for gasoline and a 1.3 MMbbl stock build for diesel.